THIS is recruiting greatness. Are YOU up to it? There has been endless talk about the future of recruitment, and I have suggested that there are brilliant opportunities for recruitment companies, if they make the right changes. But what about the desk recruiter? The foot soldier? The person who is actually at the coalface of client and candidate interaction? What must they do to remain relevant? What skills must they develop? Well firstly, lets be clear on one thing. Many of the age old recruiter skills — which I call the craft — remain critical. In fact we need to hone and re-train in these ‘human interaction’ techniques. The future of recruitment is where art meets science. Where technology combines with highly sophisticated human influencing skills. 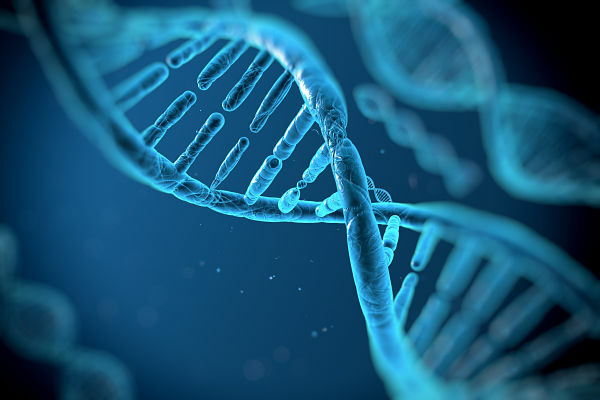 And so I put some considerable thought into defining the DNA of the modern recruiter. Have a look at the infographic for a quick view, but for the detailed skills required, read on. The modern recruiter is a complex beast. Indeed, I am now coming to believe that no one person can in fact manage all these diverse skills and tasks, nor have the range of core competencies required. So, a future blog will suggest how the structure of modern agencies should change to include specialists in sourcing, branding and networking. But for today, lets break down the four key skills sets of the modern recruiter. How do you shape up? The Modern Recruiter is a Sourcing Genius. You can’t recruit someone unless you find them first. The best candidates will not come to you. 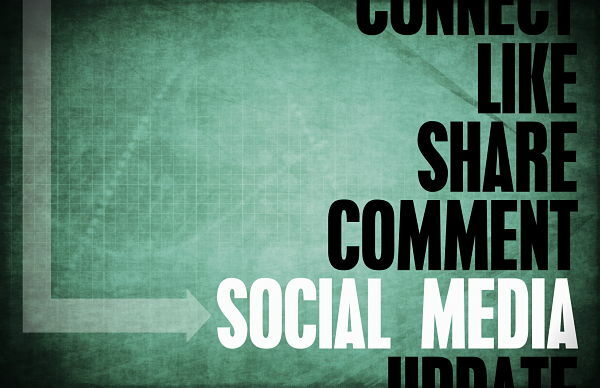 You need to identify them via deep Internet searches, including LinkedIn, but also Boolean search and social searches. The skills required here include research, online search, lead generation, legal hacking and data-analytics. It’s a geeky, techie kind of skill-set, which many of today’s recruiters clearly lack. But finding someone online is just the beginning, and frankly that is the easy part. Now it’s about engaging with that person in a sophisticated way. We can’t just spam them with Inmails, the tactic de jour, for so many lazy recruiters. That is old school and increasingly ineffective. Engagement is now a seduction, a romance. It must be tailored to each target recruit, and requires the ability to create interest, to craft a message that will get a response, to qualify prospects and crucially, the ability to phone-source, and all the nuances that this much underestimated skill-set involves. The Modern Recruiter is a Branding and Marketing champion. Built into the DNA of the modern recruiter is the ability and the discipline to develop a strong online brand. This includes using LinkedIn as a branding tool, not so much a sourcing platform. It might mean a compelling Twitter presence, or blogging (which is immediately available to everyone on LinkedIn by the way). So the skills include content creation and curation, on top of the engagement and community building. The days of the smart-arse, cocky, spivvy recruiter are over. If you talk about ‘punters’ and ‘deals‘, modern recruiting has passed you by. The modern recruiter understands that candidate experience is everything. Skills shortages mean you will rely more and more on referrals, recommendations and repeat business. So now the demeanor of a modern recruiter includes empathy, quality, service-ethic, humanity, trust and humility. 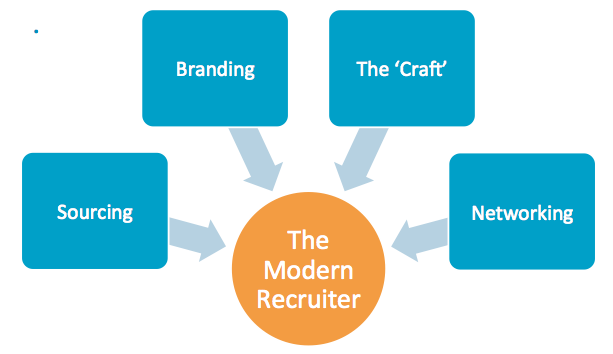 The Modern Recruiter is crazy about the ‘Craft’ of recruitment. Yes, ‘craft’. Many of these skills are as old as our industry itself, but so many recruiters lack even the basics. I am talking about the ability to finesse outcomes. To influence decision-making. To manage the process. To get a clients to see a candidate who is brilliant in real life, but patchy on paper. To manage a counter-offer. To keep a temp in a role for the full commitment. To negotiate fees and margins. This is where relationships are key. The modern recruiter is a superb candidate manager, a career coach and a part-time psychologist. They have the intellect (yes intellect!) to engage, negotiate, close and influence. They have deep industry sector knowledge and so build real trust. And you cannot fake that. The Modern Recruiter is a Networking nut! Agency recruitment is a massive and diverse job. So boo-hoo to our critics who say that the job of a recruiter is easy and basic. It is not. Done well, it’s a highly complex job, and only those dedicated to continuous learning will master the art and science that is modern agency recruiting. What do you think? Have I missed anything? Does this gel with your view of where the role of the recruiter is going? Please share your comments below. The Savage Truth Speaking Tour continues on and on. Coming up; Australia, NZ, London, Glasgow, Dublin. I also had a giggle at that Liza! Having seen many "what makes a good recruiter?" threads before, I think this is one of Greggs best, simply for identifying so concisely the crooks of what good recruiters are these days. 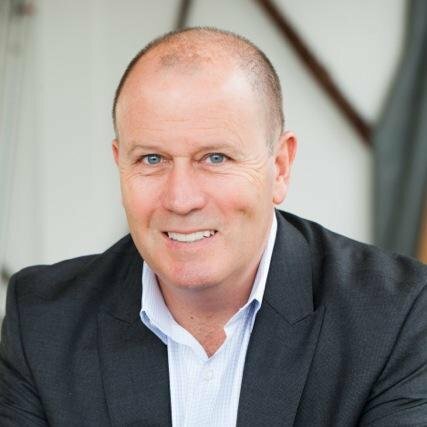 Greg, Another ripper blog. Well done. Allow me to suggest that Modern Recruiters' DNA must also include the capacity to dig deep with the Hiring Team (At least the Hiring Manager and that person's boss) as to what they need the recruiter to find in exemplary candidates / Job Champions. Yogi Berra said 'If you don't know where you are going, you'll end up someplace else.' Yes 'recruitment sure is is about sales'. And professional sales people know that it is pointless embarking on anything in the sales cycle until the first stage is nailed down. What does the Hiring Team need? - As a Modern Recruiter, where are you going? It's recruitment's job to to creatively elicit from Hiring Teams exactly what important Attributes are to be delivered in Job Champions. By the way, very few Job Descriptions cut the mustard. Greg - Do you agree that the times when misfit candidates were 'sold in' were when the recruitment industry significantly tarnished its own reputation? Yeah... Except that internal teams are growing at record pace and that ASX listed companies are hiring people for roles that have essentially 2 KPIs... Reduce Agency spend (ideally to $0) and Reduce time to hire... There's an entire industry geared around putting agencies out of business called "Employment Branding". Basically getting companies to promote themselves as work 'destinations' as opposed to offices. Companies are sick of paying high fees for candidates that they could've sourced by themselves. I'm sure there's still a market for recruitment agencies at C level / Director type roles but the traditional agency desk will be dead within 5 years. Actually, incorrect again CB. Internal teams are SHRINKING, mostly becuase time to hire is blowing out and quality of hire is dropping. Let me explain "employment branding" to you. Finding, identifying, attracting a candidate is one thing... RECRUITING them is quite another. It requires a quite separate skills set. No argument with you that many are sick of paying high fees for little value. And agencies that do just that, will fail. But those agencies that become world champions at finding unique talent in the future world of cataclysmic skills shortages will make more money than ever before. Call me in 5 years, and lets discuss. But then again, what do I know about all this? They're not shrinking though Greg... Speak to Seek and look at the increase in internal recruitment jobs posted. Better yet, look at the huge rise in the RPO model. And in answer to your question "what do I know about this?" You're running a recruitment company so it's in your best interests to pump the tyres of a flailing industry and try to prove to the rest of the world that there is value to be added by agency recruiters... Sadly for you, there is not. Agency recruitment is only going to survive in two ways; 1 the super high-end C level and Director style exec search and the on-demand short-term contract / temp style desks. Gone are the days of charging upwards of $15k for a Project Engineer with just 3 years' experience. Hey mate, yeah you're right when you disect the World into individual countries like that. I meant global recruitment agency revenue is growing. My apologies, I was just assuming on that one. I have to take that one back (if I can edit that out), I'm not sure about global job board revenue. Where is the applause button? I couldn't agree more. Your words continue to give me hope that the industry will become increasingly wise to human instincts, and not corner the employer into a sale. This is an excellent article which very accurately reflects the level of skill and aptitudes needed in a great recruiter. When performed at this level it certainly is of huge value to client companies and candidates who work with such people. It certainly reduces the fall-out of hires and increases their longevity in addition with helping organisations reach strategic directives. 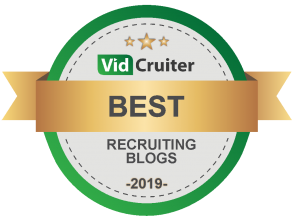 Yes there are imposters in the recruitment industry (they don't tend to last long) but conversely there are also outstanding people who really are extraordinarily valuable. Great article again Greg 5% of recruiters know EXACTLY what they are doing, 10% of recruiters follow the 5% and the other 85% are struggling and will unlikely make it into the 10%, let alone the 5%. The Modern Recruiter is in the 5%. Hi Greg, I agree, 100%. But would add sales skills as a need for recruiters. Most recruiters are still doing full 360 roles and the sales part has got a bit tougher with internal teams and stricter PSAs. It's also much harder to get on the phone too decision makers.... Like Navid said in a previous spread. The biggest failure I am seeing from new Recruiters, and new agencies, is a lack of ability to set themselves up with clients... That's the number one issue. Any thoughts on that one? I like your Post , To become a Recruiter is not an easy job and then Hire those employees which has capability to train the candidates .Training for recruitment consultants is a vital component for the recruiting companies. This is the most important aspect to be considered for the development of the company. They recruit trainers who will consider by the companies, and their work is to make the trainers best for future.